Booker High School alumnus Marlon Mack. Photo courtesy of the Indianapolis Colts. 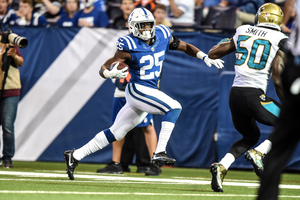 In his first season in the NFL, Sarasota's own Marlon Mack is already making contributions to his new team. Drafted 143rd overall in the fourth round of the 2017 NFL Draft, Mack has played in seven of nine games, accounting for 3 touchdowns - 2 on the ground and 1 in the air. He's rushed for a total of 212 yards on 52 touches, averaging 4.1 yards per carry. He has caught 10 passes for 110 yards, and returned one kickoff for 35 yards. Mack's best week came in Week 5 against the San Francisco 49ers, at home, where he rushed for 91 yards and a touchdown on 9 carries. He also caught a pass for a 2-yard gain. The Colts won that game, 26-23. It was their second win of the season. A Booker High School alumnus, Mack rushed for 1,527 yards and 19 touchdowns his senior season. He scored a total of 22 touchdowns on offense. In addition to his skills on the offensive side of the ball, he also doubled as a safety. He registered 100 tackles on defense, and intercepted 4 passes. He was a four-star recruit coming out of high school, eventually committing to the University of South Florida, and declining offers from Nebraska, Purdue and Indiana, among others. One of Mack's major career accomplishments came in 2014 in his first game as a Bull. He tied a school record at the time, rushing for 275 yards. He finished his freshman season posting a school record of 1,041 rushing yards on 202 carries. He scored 9 touchdowns in 12 starts. By his junior season, in 2017, Mack was named the school's all-time leading rusher, surpassing Andre Hall's career rushing yards. He earned first-team All-American Athletic Conference honors each of his three seasons with the Bulls. He entered the draft immediately after his iconic junior season. According to the NFL's draft scouting profile, Mack's major strength was his ability to shift and change directions with ease, leaving defenders on their toes. He also has historically displayed breakaway speed, able to outrun defenders once he's out in the open. He was most closely compared to former Jacksonville Jaguar and University of Michigan standout Denard Robinson. Mack and the Colts return home this week to face the Pittsburgh Steelers before their Bye Week. They are 3-6 heading into this week's matchup.